Mind Blown Studio specializes in the art of hot glass blowing. Visitors will see our local gaffer creating one of a kind glass pieces. Classes are available; no experience is needed. All pieces are for sale and shipping is offered. 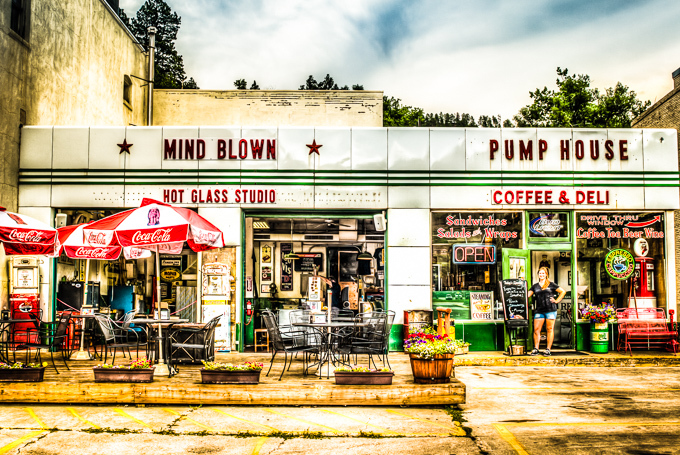 Pump House at Mind Blown Studio creates a relaxing environment where residents and visitors can enjoy locally roasted coffee drinks, pastries, snacks and a variety of cold drinks. Beer and wine are also available. Enjoy the beautiful Black Hills and the charm of Deadwood while watching hand crafted glass sculptors being created.